The Fellowship was fortunate enough to obtain a copy of WART #1 from Zombieburger.com Productions. Chris Welch writes and Ammar al-Chalabi draws. Wart Bellamy is just a normal gent until he gets dragged into a frozen lake by an eldritch horror. When he wakes up, he’s an inmate in a strange asylum where they refer to him as “chosen.” Once he starts having weird, vivid dreams about a book, though, he stops arguing with his keepers about whether he’s insane. This is the first compilation of the webcomic, and it’s got a really creepy Lovecraftian feel to it. As Wart’s state progresses, the art turns delightfully strange, playing with darkness, color and realism to really push the story along. And of course, the story is that something is messing around with Wart in a way that really may drive him over the edge at some point. Something is happening, and it’s hard to tell if Wart will ever be able to figure it out. If you’re into creepy horror, I think you’ll like this book. If you’re looking for an intro into creepy horror, especially one that’s not loaded with gore like most horror these days, Wart is a great place to start. 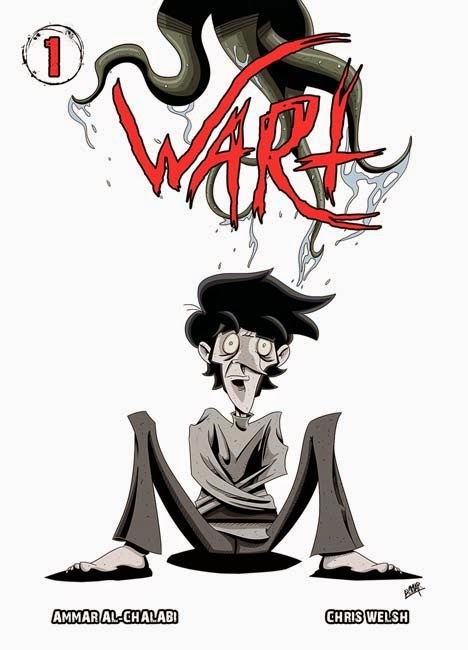 WART #1 is available now at wartcomic.com. You can also contact them on Twitter @WartComic and facebook.com/WartComic to order it.